I think that the majority of people would agree that the need for electricity is pretty much a necessity when trying to get by in our modern world. Even the most hardened of environmentalists would be hard pushed to get by in life completely free of electricity, I mean how on earth would they blog? 🙂 In all seriousness though, we need some kind of power these days and unfortunately the companies who control that power are acutely aware of it, and this is reflected in the bills that we pay. What though if you could create your own power? We’ve all known about renewable energy for some time now and many people may have viewed it as a thing for the treehuggers or perhaps as something that is only for those people who can afford to invest in it in the first place. Although to some extent the latter may be somewhat true, it is also true that many who were sceptical in the past have actually been won over to the way of renewables and have only regretted not getting involved in it sooner. So if you want to start creating your own electricity, what options are available to you? Here are 3 of the most popular ways of creating your own electric and perhaps even creating enough of the stuff to give yourself a side income too. Whether or not you view wind turbines as the energy source of the future or as an eyesore on the countryside, it is fair to say that more and more people are getting used to the idea of wind power as a possible source of renewable electricity. 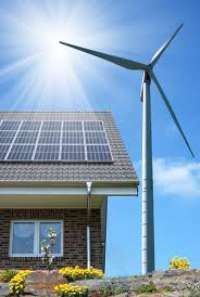 You also don’t need to have a huge skyscraper sized wind turbine in your garden to be able to take advantage of the benefits of wind energy, as many smaller sized and cheaper wind turbines – which can fit on the top of your house – could go some way to contributing towards your energy needs. If you are able to install a larger turbine though, then you could find that you are not just providing your own energy but that you are also being paid for any excess energy that you produce and send back into the grid. Solar Energy is one of the most popular ways for homeowners in the UK to create their own electricity. You don’t need a huge amount of land or a nearby stream, all you really need is a roof on your house and enough capital to invest in the solar panels. The main thing that puts many homeowners off of the idea of solar energy is the initial outlay that’s involved with installing the panels and also that it can take many years to make your money back from that initial investment. If you do have the money to invest though, then you could find that solar energy becomes one of the best investments that you have ever made. If you are offered solar panels for free by a company however, then be sure to read any terms and conditions so that you fully understand the implications of any such deal, as some of these companies may require you to maintain the panels at your own cost or there may also be other terms and conditions which turn a seemingly good money saving deal into an otherwise bad deal which costs you a lot more than you had anticipated. I’ve left hydro energy until last because in most cases taking advantage of Hydro Power requires you to be a land owner and to have a stream of water on your land which you are able to divert. This would not only require a lot of land but it would likely also require a lot of cash to divert the stream, as well as expertise to be able to build a water wheel and connect up the power sources. If you do happen to have all of these things at your disposal then you could find that you never have to pay for electricity again as the amount of power that a water wheel can provide can be substantial. For the majority of us though, hydro power will simply not be an option. Have you taken advantage of any of these renewable energy sources? Switch to the cheapest Gas & Electricity Supplier before it’s too late! When I purchase another home I have decided to invest in solar energy. I have not researched the initial investment, but I have heard that people actually make money with them. Is this true?